This experience was something I’d been intrigued about trying for quite a while. Cryotherapy is the upmarket version of an ice bath and CRYO offers a modern spa environment with chambers that deliver the iciness without actually having to touch any ice cubes! The word on the street is that it burns up to 800 (!!) calories in a single session, which is 3 minutes long. Cryotherapy is also supposed to be fabulous for cellulite and collagen rejuvenation. CRYO has a sense of mystery about it. It’s one of those treatments you always think about doing but then dismiss as a fad. Why waste money when you know that the tried-and-trues like a sports massage or hydro facial will deliver results without disappointment? But then you see photos of chambers with dry ice smoke pouring out of them like a sci-fi movie scene and it piques your curiosity a bit more. Then you check out their strong social media presence and compelling reviews. I figured, if anything, it would offer a brief respite from the suffocating heat. 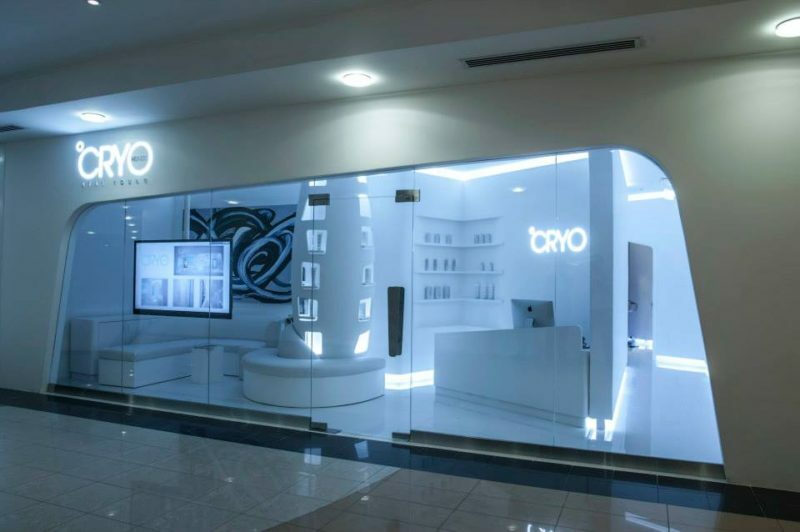 I ventured to the CRYO at the Dubai Ladies Club on Jumeirah Beach Road (and I’m so glad I chose this venue because I was totally in my element). After hitting about my 20th traffic light on Jumeirah Beach Road, I finally reached the club, perfectly situated next to the prestigious Four Seasons. Walking through the doors of the club feels like walking through the wardrobe into the magical and beautiful world of Narnia. At least, that was my perception. The atmosphere is calm, sophisticated, and relaxed and it creates this wondrous bubble that makes you forget about everything else. You won’t want to leave until you absolutely have to — I struggled to put one foot in front of the other when leaving and it wasn’t because I had just spent time in a -140℃ chamber! The CRYO facility is tiny but the staff were wonderful and super efficient. The woman who helped me was particularly impressive. She must have swallowed the cryotherapy manual because our Q&A flew back and forth like a Wimbledon match. Whatever I asked, she knew. Facts, figures, the whole lot. The first step was to complete an in-depth questionnaire, which is done together with a staff member who will question you as you go along. It was thorough and intense and I loved every minute of it! But, of course, I’d rather the keen attention to detail, considering I was about to face temperatures of -140℃. I was then taken to the changing room where you strip off everything except underwear (they provide you with a temporary pair). Throw on some thick woolen socks, North Face slippers, and a dressing gown and that’s how one properly meets the pod for the first time. You can burn anywhere from 500 to 800 calories in a single whole body session. Cryotherapy is also great for athletes with pulled muscles and for cellulite and collagen rejuvenation. As mentioned before, it’s a cosy space but they make it work. It was neat and tidy and the rooms are clean with soothing, futuristic blue lighting. Once changed, you step into the futuristic-looking chamber with just your head popping up out of the top. That’s when the fun begins! For 3 minutes, you freeze. Have someone take a photo of you during this time because it will serve as great conversation fodder for months to come! (Until there’s photographic evidence of you trying the next crazy trend, that is!). No pain, no gain, I say! Or, in this instance, no freeze, no gain! When I emerged from the chamber, there were plenty of tingling sensations all over my body. This happens as the blood hits your internal organs to protect them from the cold but after a minute or two of warming up and moving around, you’ll feel quite energised! In fact, I felt so rejuvenated after freezing my bottom that I opted to do their 10-minute CRYO Glow facial. What’s the point in freezing 90% of your body – may as well go whole hog!! A tube blew -140℃ air over my face, which I actually found incredibly relaxing. Even the simple process of removing my makeup and cleansing my face was better than some facials I’ve experienced recently. The Dubai Ladies Club is a bubble, with everything from group fitness classes to retailers like YAZY and Lorna Jane, so you can make a day out of it! I’d recommend going to Asalla Spa first, then to CRYO for an energizing treatment and finally a juice or lunch at the cafe/restaurant Remaliya. CRYO offers both single and package sessions, so if you want to enjoy 2-3 treatments per week the packages are a great option as it works out to a lower rate per session. Will I do it again – YES. But I’d line it up after a spa treatment. Personally, I like feeling relaxed but sometimes I don’t want that sluggish feeling after a massage. My plan is to have a spa session and then crawl over to CRYO to wake up! I’ll also alternate with my facials. No matter what, after a CRYO treatment, you’re guaranteed to hop, skip, and jump out.